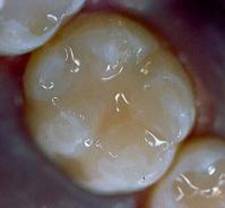 Dental Sealants - Preventing Decay! Dental sealants are a great form of preventive treatment, as they dramatically reduce cavities in back teeth (molars). Permanent molars tend to have deep grooves and pits, in which food and bacteria collect. Leaving this accumulation in the grooves will lead to tooth decay. It is important to seal permanent molars soon after they erupt, usually between 6 and 7 years of age. Placement of sealants is a painless process for your child. 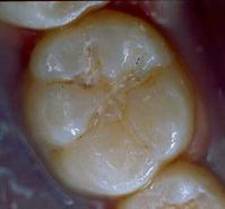 The grooves of the tooth are thoroughly cleaned under magnification, and a solution is placed on the tooth to increase the bond. The sealant material is then placed into the grooves of the tooth, drastically reducing the chance that the tooth will develop a cavity. For small or medium-sized cavities in permanent or primary teeth, we place a variety of tooth coloured, resin (plastic) filling materials. 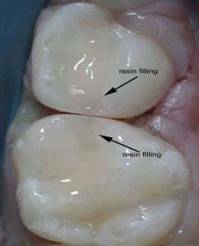 The resin materials we use today are bonded to the tooth which increases adhesion of the filling material to the tooth as well as strengthening the decayed tooth. We use a variety of resin filling materials so that we can match the right material, properties, and color to each tooth. Our goal is to not only provide an excellent esthetic result but also a strong functional filling. 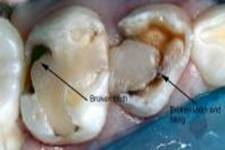 Shown are immediate before and after photos of two resin fillings placed in primary molars. In many cases, we provide care for children who are affected by early childhood tooth decay, a very aggressive form of decay that will rapidly consume a child's teeth unless treated quickly and aggressively. The photo of decayed front teeth shown on the immediate right was taken just before treatment was provided to this three year old. The second photo on the far right was taken six months later at the child's next check-up appointment. 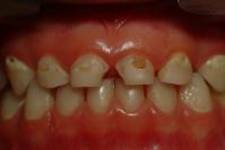 The decay in this child's front teeth had almost destroyed them. Filling them was not an option because of the extensive destruction. Repair of these teeth, with resin (plastic) bonded crowns, was important so that this child could eat and speak normally. These pictures illustrate what a beautiful functional and esthetic result we can achieve with modern dental treatment. When there is more destruction of the front teeth, as shown in the photo on the left below, metal crowns with plastic tooth-colored facings are recommended. The pictures below show such a case. The postoperative photo, on the right below, was taken 2 years after treatment and indicates how esthetic and durable these crowns are in the young child. 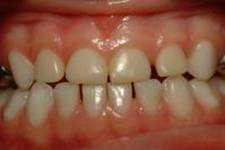 We provide care for children who often have very large cavities in one or more of their primary (baby teeth) molars. Treating these cavities with large plastic fillings, although cheaper initially, will ultimately lead to failure and a need to retreat. In the long run, this is more expensive for you, and more difficult for your child. 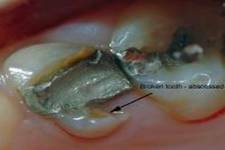 The alternative is to place stainless steel crowns on teeth which have cavities too large for fillings. Although they are not esthetic, as they are made with surgical grade stainless steel, they are very functional and durable, lasting until the primary molar is replaced by the permanent tooth. The photos show the same child before and after placement of a stainless steel crown and a resin tooth coloured filling. Our goal is to provide your child with treatment which is both scientifically proven and which will, based on our years of experience and specialty training, give your child exceptional service. 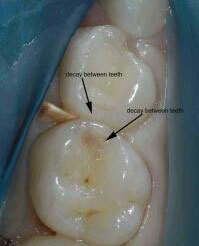 But, many parents ask why we cannot simply always place fillings in children's baby (primary) molars. The pictures shown below are examples of what happens when inappropriate treatment is chosen either by parents or dentists. Unfortunately, the teeth shown in these pictures cannot now be saved and must be removed. Material above used with the permission of Dr. Alan Milnes.